They gathered in Borough Gardens, first just a few, then dozens and then hundreds, all with one purpose and one voice: to stop the badger cull! 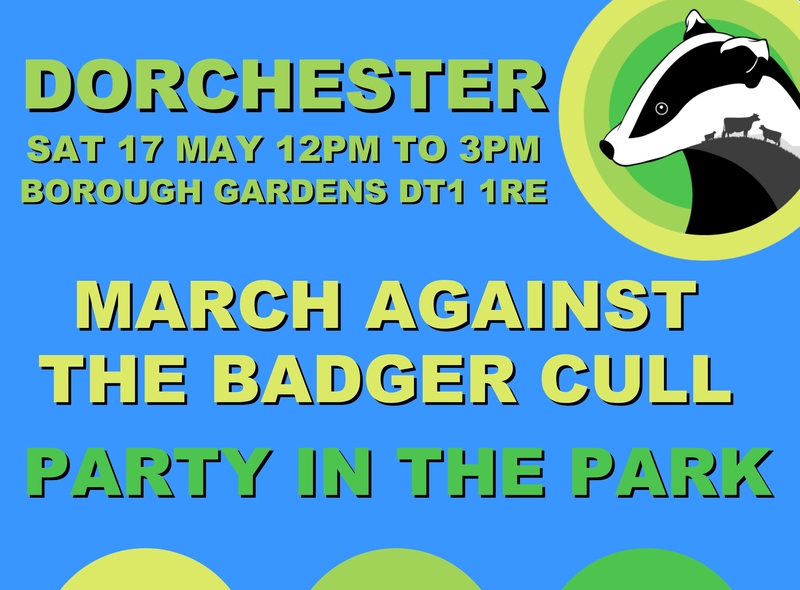 The marchers filled the streets of Dorchester, the drums beat time, the town crier announced us and the Badger Trust’s Dominic Dyer explained why we were there. It was a wonderful sight and even better sound as the streets echoed with the refrain “Save Our Badgers, Stop The Cull!” After an hour on the streets we all returned to Borough Gardens for amazing food from Fairfoods and great music for Dorset bands The High C’s and Sketchy Dog. To all those who came and to all those who made it happen, thank you. Together we are an unstoppable force, and we’re only just getting started! 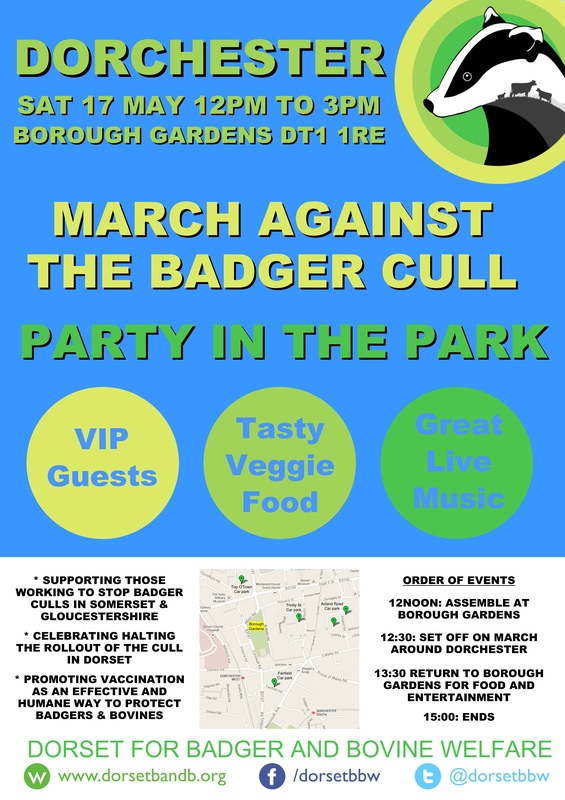 We are very excited to announce a march against the badger cull followed by a party in the park in Dorchester on Saturday 17 May, 12pm to 3pm, Borough Gardens. First and foremost, this march is to support our friends in Somerset and Gloucestershire who face yet another tough Summer spent protecting badgers. We will be organising teams to go and support them during this incredibly stressful but crucial time. In Dorset we will be focusing on promoting badger vaccination and are pleased to have a speaker from the Dorset Badger Vaccination Project, as well as other special guests. The fact that the badger cull has not been rolled out to Dorset this year is a huge victory for everyone who has been fighting against this insane policy, so we felt celebrations were in order. After the march Fairfoods catering will be serving delicious veggie food and there will be live music from some of Dorset’s finest bands. Borough gardens is a lovely spot and we’ll be keeping our fingers crossed for sunshine. 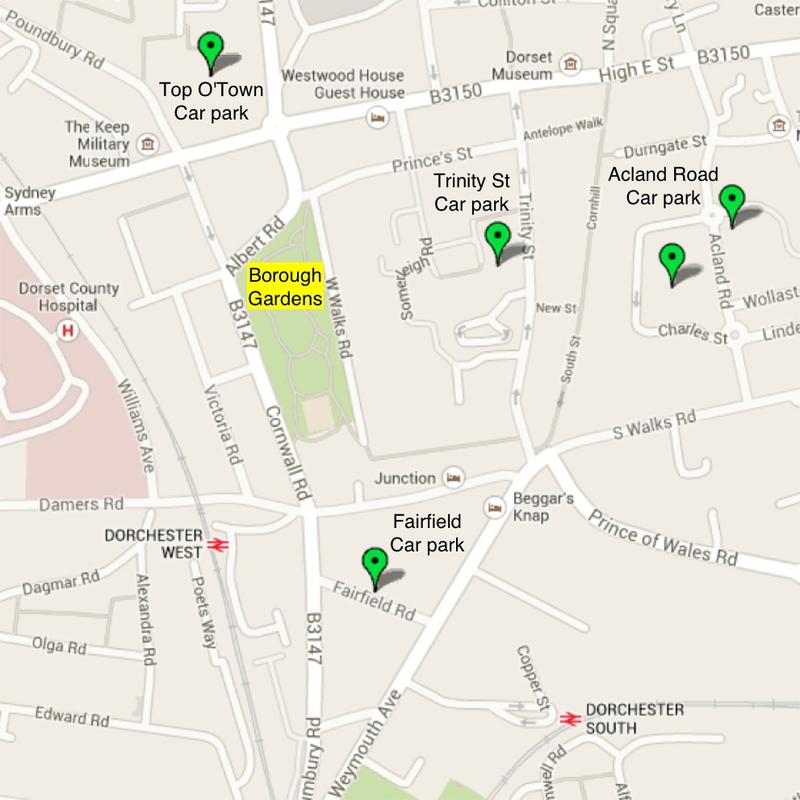 We ask that everyone assemble in Borough Gardens (DT1 1RE – see map below for location and nearest car parks) at 12pm, ready to march through town at 12:30pm. We aim to be back in Borough Gardens for 1:30pm, where we will have food and music until 3pm. Please help us spread the word by sharing this blog post and if you’re on Facebook please join and share the event page. 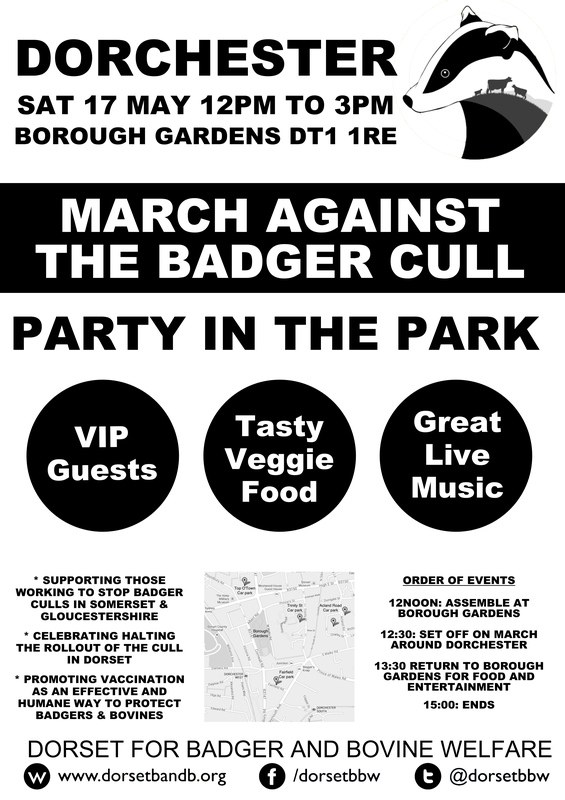 You can also download a poster advertising this march, either in colour or b&w, as well as a double-sided A5 flyer. We also have professionally printed copies of these materials that we can send you to distribute in your area. Hey, NFU, Have a Heart for Badgers! 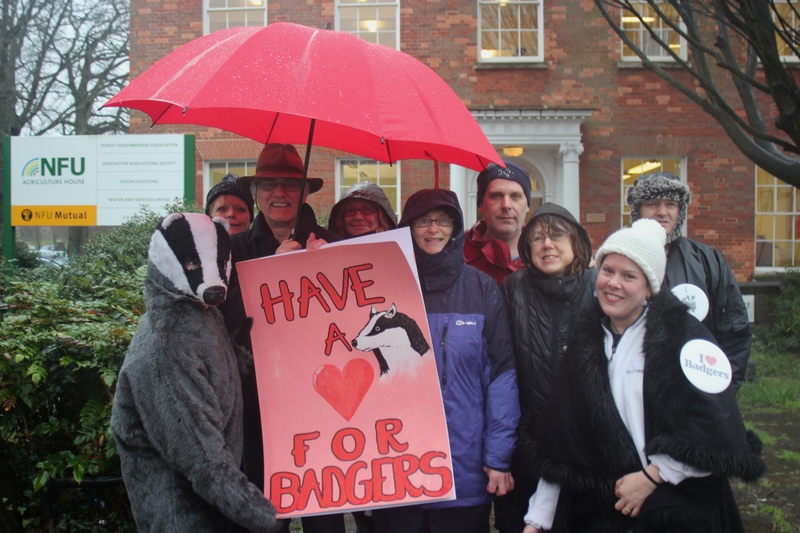 Supporters of Dorset for Badger and Bovine Welfare, some dressed as badgers, delivered a giant Valentine’s Day card to the Dorchester offices of the National Farmers Union (NFU) urging them to “have a heart for badgers” on Valentines Day. The NFU are lobbying for a mass cull of badgers, under the guise of preventing the spread of bovine tuberculosis (bTB). Last year trial culls were undertaken in Somerset and Gloucestershire to ascertain if shooting free-running badgers was feasible and “humane”. At present the evidence points to the trials being a shambles, falling far short of their intended targets and causing significant harm to wildlife and local communities alike. Further more, a government-funded 10-year randomised badger culling trial produced clear evidence to show that badgers were not a significant vector for transmitting bTB to cattle and that improved cattle movement controls and biosecurity on farms was the key to managing the disease. Wildlife and conservation groups as well as progressive farmers are backing humane, effective and scientifically sound vaccination of badgers, with herd immunity achievable in just 5 years. The Dorset Badger Vaccination Project (www.dbvp.org) is offering low-cost badger vaccination to all Dorset farmers and landowners as a cheaper and more effective alternative to culling. We’re asking the NFU to stop playing political games, to review the scientific evidence which shows culling badgers is a waste of time, and to embrace modern, humane and effective vaccination instead. Having a heart for badgers means recognising that they are an important part of the British countryside, that their welfare and the welfare of cattle requires long term solutions such as vaccination and better farm management practices, not short term appeasements like culling which has been shown will make matters worse for all concerned.